Chicago sculptor Lou Cella ’85 submitted this work of St. Louis Cardinals great Stan Musial for a previous year’s Postcard Art event. Cella, who has created larger-than-life statues of Redbird hoops star Doug Collins ’73 and Chicago Cubs Hall of Famer Ernie Banks, will once again be submitting work for this year’s event. One of this year’s Postcard Art submissions honors St. Louis Cardinals Hall of Famer Stan Musial, who died in January. Lou Cella ’85 is known for working big. He has created larger-than-life statues of former Redbird hoops star Doug Collins ’73 and legendary broadcaster Harry Caray, and his 7-foot-tall sculpture of Chicago Cubs great Ernie Banks towers over baseball’s unluckiest fans as they enter Wrigley Field. But for the last four years, Cella has agreed to return to his roots and create much smaller works for his alma mater. “Before I worked big, I worked small,” he said. This year, Cella is once again crafting a couple of reliefs—sculpted in clay and cast in resin—for the Friends of the Arts annual Postcard Art event set for April 27. He and all the other participating artists are restricted to making works no larger than 4 inches by 6 inches, i.e., postcard size. Within this small space Cella has taken on large subjects, physically and metaphorically speaking. In his first year, he created a street scene of Uptown Normal that included Watterson Towers, the tallest building in Illinois this side of Chicago. One of his later works depicted Paul McCartney as he appeared on the cover of The Beatles’ Abbey Road album and hinted at the Paul is dead hoax. Cella said he really gets into designing the Postcard Art reliefs and appreciates the opportunity to help the College of Fine Arts and its students. Postcard Art, a live auction event going on its sixth year, is the Friends of the Arts’ largest fundraiser for the college. Last year, the event attracted 200 art donations—from students, community members, and nationally renowned artists like Cella—and brought in $19,000 that was put toward scholarships and grants for Fine Arts students. While all Postcard Art attendees go home with a work as part of their $60 admission, some of the pieces have drawn bids of more than $2,000. Last year’s big moneymaker was an oil painting by James Butler. A 2013 Postcard Art submission. The quality and variety of work are strengths of the show, he said. Harold Gregor and Butler, nationally renowned painters who taught at Illinois State and whose paintings hang in the White House and the Metropolitan Museum of Art, respectively, have contributed pieces every year to the event. And the show has attracted the gamut of artistic expression: mixed media, wood carvings, metal fabrications, clay sculptures, paintings, drawings, photographs, and this year, a couple of works made of chocolate. “You really feel like you are in a museum environment,” Cella said. Butler said he prefers to work large, but enjoys participating in the event because it is an opportunity to give back to Illinois State University. He paints primarily in oil, creating landscapes that display a lot of movement. He called his work realistic but not always literal. 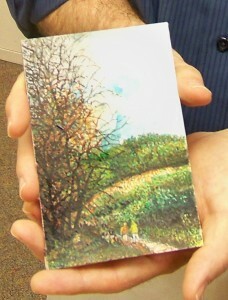 Despite their size, the Postcard paintings take several weeks of very detailed work, Butler said. “They’re pretty exhausting,” he said. 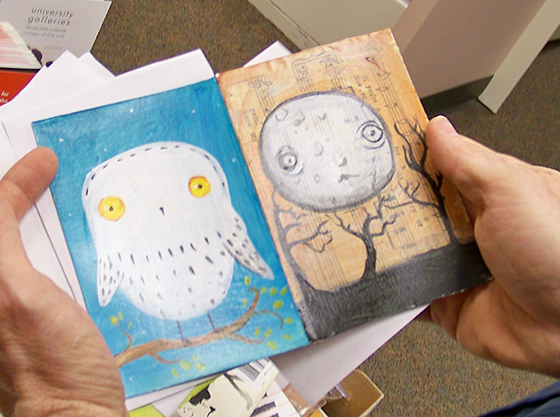 Gregor has been doing a lot of watercolors paintings for Postcard Art that he uses as sketches for larger works. This year, he is submitting paintings he called vibrascapes: whimsical, imagined landscape paintings. Gregor said he sometimes plays around with his Postcard paintings in order to disguise who painted them. One of the interesting aspects of the event is that the artist’s name is on the back of each piece, so bidders do not know whose works they are bidding on. Guessing who made what is part of the fun of the event, according to John Walker, executive associate dean of the College of Fine Arts. The approach means bidders “choose art based on the art they like, not the name of the artist,” Walker said. The guessing game might be easy for lovers of Cella’s art. He said anyone familiar with his work will immediately recognize it. “The style is pretty individual,” he said. When: The auction will be held 6–10 p.m. Saturday, April 27. Bidders are encouraged to attend the auction preview, to be held 5–7 p.m. April 24. Cost: Admission is $60 and comes with an open bar, one $50 voucher good for one piece of Postcard Art, and live performances by Illinois State theatre and music students. Tickets: Available at the College of Fine Arts Box Office, by calling (309) 438-2535, or at any Ticketmaster location. More information: Visit the Friends of the Arts website, email the Friends of the Arts, or call the College of Fine Arts at (309) 438-8321. Kevin Bersett can be reached at kdberse@ilstu.edu.